Cinq à Sept "Nanon" floral-print silk dress. High neckline; ties at side. Aidan Mattox crepe cocktail dress with beaded mesh inset at top. Approx. 39"L down center back. Crew neckline. Sleeveless. Left side slit. Sheath silhouette. Knee-length hem. Hidden side zip. Polyester/spandex. Polyester lining. Spot clean. Imported. 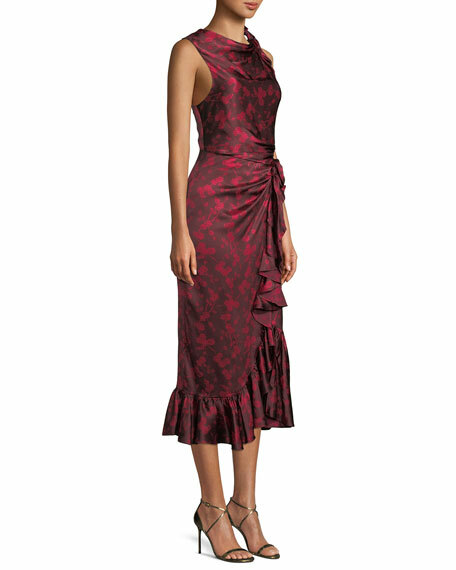 Badgley Mischka cocktail dress in stretch crepe. Funnel collar ties at left. Sleeveless; moderate shoulder coverage. Sheath silhouette. Hem hits below knee. Pullover style. Polyester/spandex. Lining: polyester. Imported. Model's measurements: Height 5'10"/177cm, bust 33"/84cm, waist 25.6"/65.2cm, hips 35.8"/91cm, dress size US 2-4/FR 34-36. Elliatt "Angelina" sequined dress with contrast straps and trim. Approx. 42"L down center back. Square neckline. Shoulder-tie straps. Mermaid silhouette. Elliatt "Angelina" sequined dress with contrast straps and trim. Approx. 42"L down center back. Square neckline. Shoulder-tie straps. Mermaid silhouette. Midi length. Tiered hem. Center back zip. Polyester self/lining. Hand wash. Imported. Model's measurements: Height 5'10"/177cm, bust 33"/84cm, waist 25.6"/65.2cm, hips 35.8"/91cm, dress size US 2-4/FR 34-36.